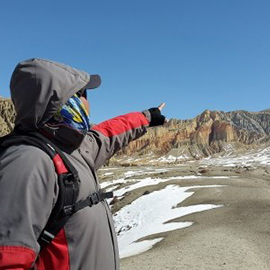 Adventure Hub Nepal is here to give you lifetime opportunity an ultimate challenge to the ambitious trekkers, this moderate to challenging graded trek takes to you to the foot of Mt. Everest traversing across the high Cho La pass at an elevation of (5420 m) Also included is the opportunity to trek to the summit of both Gokyo Ri (5340m) and Kala Pattar (5554m) for magnificent views of Everest, Lhotse, Nuptse, Makalu and Cho Oyu . A visit to Everest Base Camp will give you the chance to have a closer look at the spectacular Khumbu Icefall. If you don’t have your own sleeping Bag, then you can rental in Kathmandu and if you need down Jacket rent you can get this in Kathmandu as well just let us know. We suggest a tip for the guide and porter after the trek - Plan on a at least 5% to 8% of your trip cost (more will be appreciated). ther things not included on the trek are; Wi-Fi, charging batteries and hot showers. (if you want hot shower included then trip cost will go up) Wi-Fi is available in some tea houses for $3 to $5 an hour. Hot showers are also available in a few lodges for around $4- and charging costs about $1.50 an hour. It may end up that there will be unforeseen costs due to flight cancellation, weather conditions etc. You are responsible for extra hotel nights ($50/night) and meals in Kathmandu for any extra days in Nepal due to flight delays. when you arrive in Kathmandu on a clear day is in itself an exciting and memorable experience. The panoramic view of snow-capped mountain peaks sprawling down below is worth a sight. 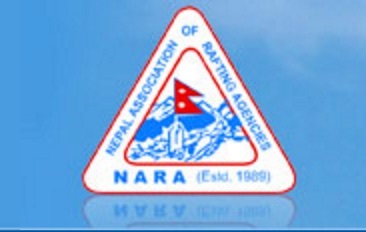 At the airport and then Adventure Hub Nepal support team will meet you and take you to your hotel relax from jetlag. Kathmandu valley has lots world haritage,historical and cultural site heart of Nepal, is a popular destination for tourists. The city presents a wonderful mixture of Hinduism, Tibetan Buddhism and Western influence in the Valley. Patan and Bhaktapur, its two major neighboring cities bear immense historical, cultural and religious significance. There will be a half day guided tour to the famous and biggest Hindu shrine of PASHUPATINATH, the largest Buddhist stupa in Nepal BOUDHANATH, the 15th century palace of 55 windows and SWAYAMBHUNATH. after you done you all sightseeing will drop you to your hotel for quick shower and meet for our Pre-departure meeting about trek in evening. We fly from Kathmandu to Lukla [2800m], a small airstrip high above the Dudh Kosi valley. After meeting our trekking crew and sorting out our gear, we begin the trek by descending to Chaunrikharka and heading up the Dudh Koshi valley to Phakding, where we by the river in the lodge. From Phakding, we cross and re-cross the river on high suspension bridges. Beyond Monjo is the entrance to the Sagarmatha National Park which was set-up in order to protect and preserve this fragile mountain environment. We then ascend up to Namche and along the way, if the weather is clear, catch a first glimpse of Mt Everest in the distance. Namche is the main trading village in the Khumbu and has a busy Saturday market - a meeting place for the Hindu traders from the lowlands and the Tibetan yak caravans that have crossed the glaciated Nangpa La.We camp near the bazaar at Namche stay night. Namche is tucked away between two ridges amidst the giant peaks of the Khumbu. It has an abundance of lodges, tea shops and souvenir shops. It is an ideal place to spend a rest day, acclimatising to the new altitude before heading off towards Gokyo. 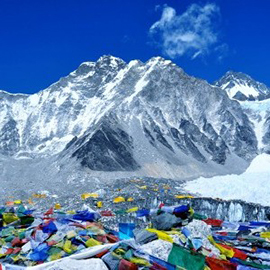 Options for acclimatization walks include a visit to Khunde Hospital, which was set-up by Sir Edmund Hillary, or a one hour walk up to the Everest View Hotel above Namche.From there you can watch the sunset over Ama Dablam, Nuptse, Lhotse and Everest. There are also good views from the National Park Centre and Museum just above the village. We are now approaching 4500m, so we will stay at Machermo for an extra day .Today is a spectacular day in terms of scenery as we follow the main trail north out of Namche. A short climb to a crest reveals a wonderful view towards Everest and Lhotse. We follow this main trail for a while longer, passing many traders selling Tibetan handicrafts, to a crossroads high above the Dudh Kosi. The trail to Everest drops down the hill but we turn off here and climb to cross the Mon La before reaching Phortse Tenga. From Phortse Tenga, the trail climbs steeply to Dole, through rhododendron and birch forest festooned with hanging mosses and lichens stay night here. From Dole we climb steadily along the side of the valley, where the rhododendron forests give way to scrub juniper as the altitude increases. The trail passes many summer settlements (yersa), which are used when yaks are taken to these pastures to graze in the summer months. Ahead of us are excellent views of Cho Oyu, while at the rear are the peaks of Kantega and Thamserku. Today’s trek is a short one and we will arrive at Machermo in time for quick lunch break and after that will continuing our trek to Machermo. today we are around 4500m, so we will stay at Machermo for an extra day to acclimatise. There are plenty of possibilities for exploration around the camp and just above the village there is an excellent view encompassing Cho Oyu (8210m) and the mountains which flank the Ngozumpa Glacier. we are well rested now so we head for the lakes at Gokyo. We follow a very scenic path to Pangka and then descend slightly, following one of the rivers which flow down the west side of the Ngozumpa Glacier. We climb a steep rocky incline into the valley by the side of the glacier, passing the first of the holy lakes. We soon arrive at the second of the lakes, crossing the path which heads across the glacier to Cho La - our route to Lobuche and Everest, later in the trek. The third lake is known as Dudh Pokhari and on its eastern shore is the settlement of Gokyo. Walking by the side of the lake, the scenery is breathtaking with the summits of Cho Oyu and Gyachung Kang reflected in its emerald green waters. we will have another day rest at ascent Gokyo Lake. We are getting fitter and better with high altitudes now and have been acclimatised, we leave Gokyo to cross the Ngozumpa Glacier. We descend to the second lake and drop down onto the glacier. The route across the glacier is marked by cairns and is generally quite well defined. We climb off the glacier by a small dwelling known as Tragnag and follow a shallow valley to our camp by a small kharka. To reach our next objective, Kala Pattar, the trail continues to follow the valley beside the Khumbu Glacier, and offers superb views of the surrounding mountains, especially where the path is forced to rise to cross a tributary glacier. We stop for lunch at our camping place for the night, Gorak Shep. Later in the afternoon, when the sun begins to set over the Everest, we make our way to the top of one of the finest viewpoints in the Khumbu, Kala Pattar (5549m). As the light begins to fade we stroll back to our camp at Gorak Shep and have an early night in preparation for our trek to Everest Base Camp the following day. Trek to Everest Base Camp (5357m) and return to Gorak Shep. For the trek to Everest Base Camp, a very early start is required. It takes several hours on a trail across the Khumbu Glacier which weaves its way along translucent ice pinnacles and past seemingly bottomless crevasses. At Base Camp, there will hopefully be an expedition 'in residence' and there are great views up into the Khumbu Icefall where there is often some climbing activity. On the return leg, we can take a higher route to get a spectacular view of the Khumbu icefall and the route to the south Col. We then return to Gorak Shep. It is downhill most of the way today, past Lobuche to Duglha and Pheriche. The Himalayan Rescue Association has trekkers’ aid post here which is interesting to visit. After lunch we cross the Khumbu Khola on a wooden suspension bridge and follow the Imja Khola to the village of Pangboche. We continue to follow the river and, after crossing it, climb up through birch and rhododendron forest to Thyangboche and its famous monastery. There are magnificent views from here and Kwangde, Tawache, Everest, Nuptse, Lhotse, Ama Dablam, Kantega and Thamserku are just a few of the Himalayan giants which can be seen. From Thyangboche we descend to the bridge over the Dudh Kosi at Phunki Tenga, where there are water driven prayer wheels, before making our way back to Namche. After breakfast we will take an early morning flight back to Kathmandu, you will have whole afternoon your self which you can do shopping or explore Thamel tourist hub or relax in hotel. Adventure Hub Nepal support crew will take you to the airport for your flight back home. If you prefer to stay longer, you can go for short tours such as drive at National parks, whitewater rafting, Tibet tours, mountain biking etc.